Growing Orchids Under Low Humidity Conditions. I have always been curious about what it would be like to grow orchids someplace where the humidity was very low. Extreme drought and low humidity these past three months have provided me with an experience that taught me a great deal about my normal culture and the importance of water to orchids. Initially, I tried to outlast the drought and occasionally misted lightly with the limited water supply in my cistern. Not only did bulbs shrivel and roots die, but there was a covering of salt on the medium that continued to buildup. Eventually, it was necessary to try something different. The key has been to water extremely thoroughly and often, which would not be possible in the normal summer’s heat and humidity. Under drought conditions, which have included very low humidity, the medium dries very quickly allowing more frequent, but time consuming watering, which works to keep my orchids alive, at least until the rains come. 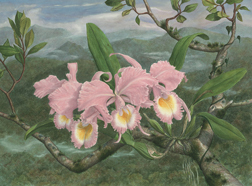 Clearly, it is extremely difficult to grow orchids well without good water. Good water contains few dissolved solids; these are mostly salts. The amount of dissolved solids are measured with a simple instrument that measures the amount of current water will carry; i.e. more dissolved stuff in the water equals more current. Pure rainwater or distilled water contains 0 parts per million (ppm) dissolved stuff, while seawater contains 35,500 ppm. Recall that most orchids in your collection are derived from ancestors that grew attached to trees, so their only water source was rainfall, and their primary nutrient source was dust that falls on the leaves of trees and drips down with each rainfall. Most orchids evolved in this nutrient poor environment, which is why they are very intolerant of water with lots of dissolved minerals. When we add fertilizer to our water we raise the dissolved solids in the water because fertilizers are nothing more than nutrient salts. Most commercial orchid growers try to add 100 ppm of nitrogen when they fertilize. Fertilizers typically also contain other nutrients, e.g. phosphorus and potassium, further raising the dissolved nutrient levels. My primary water source is normally rainwater collected from the greenhouse roof. There are always a few dissolved solids, but rainwater flowing into my underground cistern is still very pure, usually between 10-20 ppm dissolved solids. When I add fertilizer, my water contains about 280 ppm dissolved solids. Under the present weather conditions my rainwater already contains 250 ppm dissolved solids because less than 1 inch of rain has fallen over three months, and numerous ocean storms have caused heavy surf, putting lots of salt in the air and on my roof. Worse yet, these salts are mostly sodium chloride, both of which are very toxic to orchids. What is an orchid grower to do? The only other source of water available to me is from a community well, which is 360-380 ppm. Fortunately, most of the stuff dissolved in this water consists of calcium, magnesium, and iron. These salts are not toxic at these levels but do leave unsightly residue on leaves. This water is also extremely basic, which severely limits the ability of orchids to absorb nutrients. Some orchids in my collection have surprised me and thrived because they are not epiphytes and instead were derived from orchids that grew on the ground, notably Paphs. Many paphs grow in limestone rich soils and have thrived in the basic well water. Others have done very poorly, most notably phrags and some pleurothalids. They need very pure water and could not tolerate hard water. Much to my delight, and surprise, almost all the cattleyas, phals, and vandas are growing extremely well despite the high dissolved solid content of the water using the following process. First they are watered thoroughly with well water. This dissolves any salts that have accumulated on the medium since that last watering, but does render the medium surface basic. Then the surface of the medium is misted lightly with my very limited supply of rainwater to which fertilizer had been added. Most high nitrogen fertilizer is acidic, neutralizing the well water. This does, however, take a lot more time.